One of the coolest things breweries can do with beer is tie it to a greater cause. As someone who runs a beer show for a nonprofit, I'm particularly biased toward those efforts. 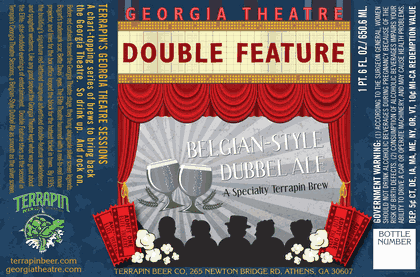 One of the cooler ones out there now is Terrapin's support for the Georgia Theatre with their series of beers created to help raise awareness and money for the theatre's restoration. 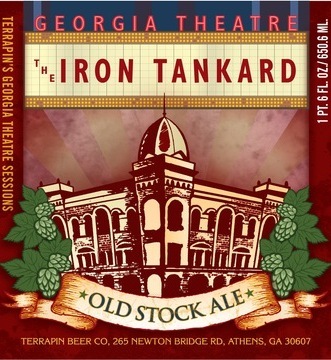 Below is the image for the first beer, the Iron Tankard, and beernews.org has an image of the second beer, the Double Feature. Each of the series (only released in GA) will have one bottle with a Golden Ticket that gives the lucky winner lifetime tickets to the theatre. Each beer commemorates different incarnations of the theatre, first as a YMCA with an iron swimming pool in the basement in the 1880s, and then as a movie theatre in the 1930s. The last two installments will honor the theatre's time as a music hall, and finally the fire that caused the need for the renovations. I love the matching of style to the historic era, with the Iron Tankard in one-color outline and the use of silhouettes for the Depression-era Double Feature. One of the toughest things to do is to create different images in a series tied together by a common element that doesn't dominate. Terrapin does that on a larger scale by often incorporating their turtle into designs. Here, the common element is the way the images are composed. The composition is similar enough to tie them together, with a bottom image (either the heads or the "Old Stock Ale" banner) flanked by two foreground items (tickets and popcorn or hops). Maybe not high art (no Italian Reniassance references here), but some very nice design work by the people at Terrapin, clearly well thought-out and executed, and all going to support historic restoration.